Finally! 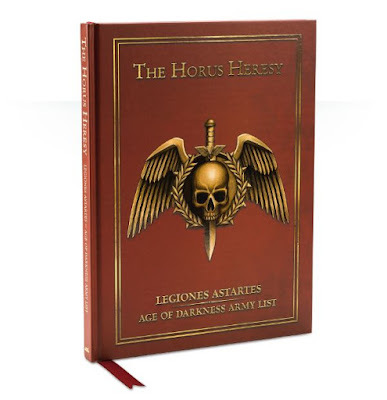 A New Legion Astartes Age of Darkness Army List. For those of you not that familiar with 30K, this is basically the core Space Marine Codex for all the Legions. In this article, I will run through the changes to our core codex and how they impact Raven Guard. First off, credit where credit is due, I'm lifting a lot of work from Black Blow Fly at Terminus Est, a fellow friend and blogger. Infantry become cheaper. The game designers are looking to obviously make armies bigger. In general, a lot of lists will have an additional free 50 to 100 points. Tanks become more expensive. It's obvious, Forge World is looking to move armies towards infantry and away from tanks. I like the change of focus. I feel many of the tank are far more more powerful than their infantry equivalents. This is largely because the tanks are usually priced to exist in 40k, while infantry are much cheaper in 40K. Core infantry cheaper compared to Legion specific units. The new legion rules recently came out and almost all the units stayed pretty similar in price. So in general, core units have gotten better compared to legion specific units. Forge World units added. Space Marine Legions picked up a lot of the standard Imperial Guard units. It honestly feels a little bit weird, but as lord of war choices we get a whole codex worth of stuff. Moritat: Updated chain fire rule include the overheat rules from the FAQ. For us Nex is probably still the go to Moritat if you want to field one, but if you do field a Vanilla Moritat, you will probably be best off running him with volkite and plasma pistols. Legion Command Squads: - 25 pts base and -5 per additional trooper. It's a significant decrease, can makes a viable squad even better. Plus you can do things like attach apothecaries to them now, but more on that later. Chaplain: Same price, but picks up fear as a freebie. 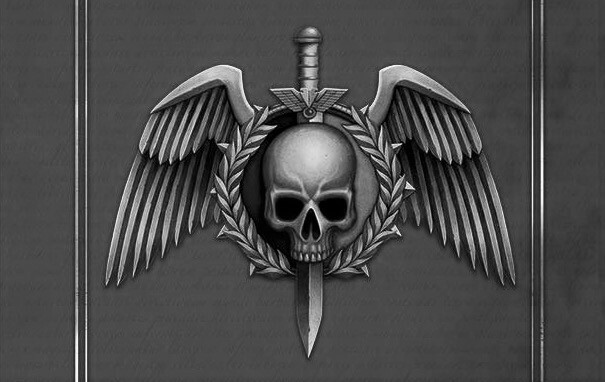 I really think chaplains are one of the better Raven Guard HQ choices, so this is a nice little bump. Veteran Tactical Squads: -25 pts base and -3 pts per additional trooper. They also kept the other weapon options from the FAQ. More importantly though is their special rule options changed. To note, these changes were made so these rules stacked better with the core rules of other legions. Resolve: Stubborn. This is a HUGE downgrade from fearless. I almost always ran my Vets with Fearless. That said, with the new price, I'm ok with it. Weapon Masters: +1 Weapon Skill. As a dedicated HTH unit, this is a doable option. They are basically 26 pts for a WS 5, 4 attack on the charge with power weapons unit, which is OK but really, we have Dark Fury for this role. Machine Killers: +1 to armor pen rolls. This is REALLY good. For one, it makes missile launcher interesting, but it also opens up a combo of a siege master + combi meltas. It's basically a S9 re rolling to pen, melta unit. Even without the melta it's good against things like Spartans. Marksmen: Outflank and Sniper. I wish this was scout... but it's a nice combo. You are going to see this used heavily in other legions. For Raven Guard, it's not really a change. That said, sniper bolter, heavy flamers and missile frage are all pretty good and now they are cheaper. Xeno Bane: Reroll To Wound against Monstrous Creatures and Gargantuan Creatures. So this is a better version of Monster Hunter. It's an odd option, as we don't really have much in the way of Xenos, but this will obviously change soon? In the meantime, I guess it's good against mechanicum. Techmarines: -10 base. Servo-automata gain heavy bolter, multi melta, and missile launcher options. Welcome to your new heavy support squads. Sure they are BS 3 but they are also 22 pt multi-meltas. You could also opt for missile launchers, but I think I prefer the S8 Ap1 24" inch shots. Missile launchers would be an option if you are baby sitting some tanks or dreads though. 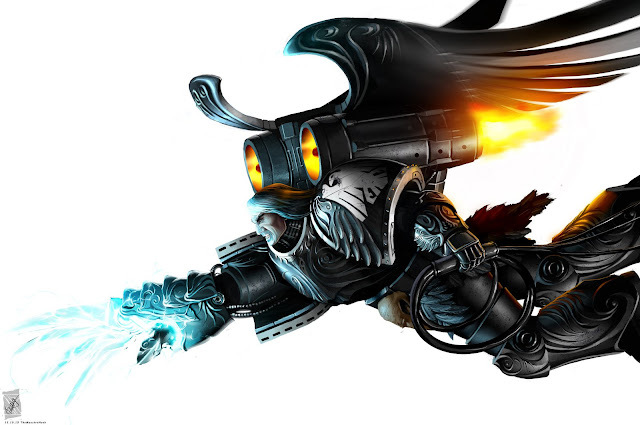 Apothecarium Detachment: Can join other, non terminator or daemon, "Legion Astartes" units of the similar kind and can take Jump Packs and Bikes. These will be great for Outriders, Company Command Squads, Assault Squads, rapier platforms and Dark Fury. Legion Rapier Squads: Thudd guns get all the new ammo types and make you purchase specific ammo. Phosphex is goign to be especially good for certain legions, although I think the standard grav cannon rapier will be my go too option. Legion Tactical Squads: -25 pts base. This was a surprise to me. I did think the basic trooper was a little expensive, but dropping their price makes the drops in price of other units less interesting. It's obvious that FW wants to make the game more infantry centric. In any case, Raven Guard really do well with big tac squads, so this is a free 50 points for most Raven Guard lists. Legion Assault Squads: -75 pts base and -2 pts per additional trooper. Breacher Squads: -25 pts base and +5 pts per additional trooper. So this change is obviously for encourage breacher in Zone mortalis. Overall, it actually means my 20 man breacher squads went up in cost by 25 pts! Legion Tactical Support Squads: Can take additional close combat weapon for 2 pts. This is a great option for us. It actually makes me consider running flamers for objective campers. Finally, rotor cannons and volkite chargers are free upgrades. This really shakes up the unit as other options are pretty good choices now. Reconnaissance Squad: -25 base. Totally needed it, but honestly I think they need cheaper wargear options as well. 5 pts sniper rifles? 5 pts Camo? Come on... Just make them free and everyone would consider running them. That said, it's a welcome decrease as I have been running the Recon ROW recently, so it's 25 to 75 pts in savings depending on if you run 1 or 3 units. Legion Dreadnought Drop pods: +35 pts. WHAT?! I think this is a Leviathan nerf... They should have left these alone and made Leviathans take Anvilus dops... Anyway, this is a big hit for those who run drop pod contemptors or dreads. I usually took two units of these in some of my lists, so it's 70 pts gobbled up. Anvilus Dreadclaw Drop pod: +15 pts and can carry standard and contemptor dread, not Leviathan or Dreadeo. This also picked the the inertia rule, which makes this unit A LOT better. I think you will see all contemptors and box dread using these now. Seekers: -20 pts base, +5 per additional trooper. Update ammo. Scorpius Ammos is 24" heavy 1, S5, Ap2 now. That is REALLY good. A10 man squad is 255 points compared to a tac support squad, which costs 325 points for 10 plasma guns. It also deals with the stupidity that the squad leader couldn't take a combi weapon... Also since they score, these are GREAT objective campers now. I think you will see most lists be cheap core troops, plus mor deythan and seekers as you add points. Primaris-Lightning Strike Fighter: +10 pts for Sunfire missiles, +10 pts for Kraken Missiles, - 10 pts for Phosphex bomb cluster, -10 prs for Electromagnetic bomb charges. Most people ran these with Kraken missiles. I don't think this is goign to change. It's still one of the only units able to reliably bring haywire to the table. Tarantulas: +5 pts each, but they get forward deployment as a built in rule. I think they belong in fortifications. These will likely to continue to be ignored. Landspeeders: -10 pts. This is a big drop in points. 65 pts for a fast moving, deepstriking unit with a grav gun & multi melta seems like a pretty good deal. Also to note is hunter killer missile are only 5 pts and you can take 2 of them. With increases in Breachers, drop contemptors and lightnings, these guys have really become a much more viable tank hunting alternative and they work really well with Alvarex Maun and infiltrators with VOX. Javelins: -20 pts. They gain strafing run and are -2 to hit in hth when not immobilized. They also get the 5 pt hunter killer missiles. They really did A LOT to make this unit more desireable, but are worth it? So 65 pts for 4 krak missile launcher shots then 2 after that? Plus you have a hvy bolter... It's a pretty devastating strike and you might get good opportunities coming out of deep strike or outflank. I'm not sure if I'm sold on them but they are MUCH better than they used to be. From a math perspective they are almost identical in price to heavy support squads at 10 man strong with missile launchers, but you pick up jink, better BS, a extra hvy bolter and cheap hunter killer options, so at a minimum these are better in a lot of scenarios than the the footsloggers. Legion Jetbike Sky Slayer Support Squadron: A new unit, which is always cool. at 5 bikes you are looking at a price of 51 pts per bike and they all come with a multi melta. They also have a 2+ save and jink and options to take a volkite culvern or a plasma cannon at additional costs. Plasma are tempting until you remember they can't fire if you jink... and Volkites are fine, but we have a lot of similar fire power in other units. It's a pretty good price point. I actually like the multi melta out of the options. They work well deepstriking with infiltrating units with vox or with Maun. Also as jet bike you could attach centurions or use them as a retinue for a HQ. These might be an interesting option for an Angel's of Wrath list. Also remember they get +1 S on the charge. The sgt can be upgraded, but I'm not sure I would bother. Deathstorm Drop Pods: So these guys got there old rule back. Hopefully they keep it. FW has been trying to get this unit right for a while now... It's a very Raven Guard unit that goes up in value at bigger games. In the right scenario, it can put out a huge amount of firepower. I personally think it's overcosted. I would like to have seen it cheaper and able to be be taken as a 1 to 3 choice and usable to shuffle 1st turn pod units. Land Raider Phobos: -25 pts. The land raider phobos is a good unit even at the old price. It's not something I have seen used much though. It's either eclipsed by the efficiency of a Spartan being 100 pts cheaper than 2 land raiders, infiltrating being free of having disposable transports of rhinos and drop pods at only 35 pts. BUT it does have an assault ramp so it is great for hard hitting assault units. So it is a solid choice for 5 terminators a 10 man vet squad tooled up for hth and combis is a nasty unit that expensive enough to want a durable ride. BUT... We do have the Liberation Force ROW. One of the strong ways to run that ROW is to take A LOT of AV 14 between leman russes and land raiders. In that list, the price drop gives to you some points to play with. Land Raider Proteus: -35 pts. The proteus is basically a an armored Rhinos. Giving it scout is a cool option but at 50 pts it's really expensive. That said, the Proteus is basically a land raider for shooting units. So think Mor Deythan, seekers, tactical support squads, etc. Land Raider Achilles: Quad launcher picks up the option for incendiary shells, splinter shells and phosphex. All are nice options. For Raven Guard, it is a resilient rear guard unit that can keep a small scoring unit safe, as the rest of the army infiltrates forward. Vindicator: Now can be taken in squadrons of 1 to 3. This is a hugely powerful option. Both the laser array and demolisher cannon are solid options. They work well with decapitating strike when you can only take a single heavy choice. Spartan: +10 pts but Laser Destroyers are a free option. The flare shield is also +20 pts, which is probably appropriate but is a serious point expenditure now. Regardless of increases in points, this is still your goto land option for big units. Sicaran Venator: Gains the option to take a second pintle-mounted weapon, which for a long range tank is not hugely useful. Sicaran: 30+ pts and can a pintle mounted weapon. The pintle mounted weapon is a nice option to cheaply increase the firepower of the tank. It also opens up an anti infantry route. 3 heavy bolters and the 6 shot auto cannon is 15 shots at 36". That's a fair amount of dakka on a fast, AV 13 tank. Kharybdis: -25 pts. It still seems overcosted to me, but Raven Guard do have cheap 10 man pods and can infiltrate 20 guys for free. I think the most viable unit in a Raven Guard would be 10 terminators. Deredeo Dreadnought: Gains a new tank hunting weapon and it's very good. A 48" S10 AP2 weapon with 2 shots is great. But it also has a nifty rule where if you cause an additional pen on a 4+. It makes the weapon a little boom or bust, but I think it is a pretty good option for tank hunting, which is always the problem I'm trying to fix with Raven Guard. That said, it's not as efficient as grav unit IMO. Whirlwind Scorpius: Can take a pintle-mounted weapon. This is one of those options you take so that your main gun doesn't get blown off as easily, so combi weapon it is! Malcador: -25 pts and a nice addition to the heavy slot. It also has a nifty Battle Speed rule to fire it's main weapon if it moves flat out. It seems weird that they added it to the Legion List... but you will find it's a hugely customizable super heavy in your Hvy slot. And being a super heavy, you can target multiple units, so side sponsons are especially useful. What this tank excels at is taking out small skirmish units and the like. It can also be taken as a 1 to 3 option, so if you really want to milk the 1 heavy slot in decapitating strike ROW this is probably your unit. Typhon: +45 pts base is a big chunk more expensive, but it was one of the better unit in the game and it seemed a little cheap for the amount of damage it put out. At higher point levels, this is a go to tank in my arsenal. It works very well with lots of haywire to crack open tanks and the typhon clears the infantry. Falchion: +25 pts. It also picks up the option for a neutron wave capacitor which adds the feedback and shock pulse rules to the volcano cannon, which basically makes a unit that it shot only able to fire snap shots, but if you don't pen with your shot, on a 1 you take a hull point. So basically, you can lock down another supper heavies shooting if you can keep penetrating. The Engine of Destruction: Basically a cap of 1 unit with 9+ HPs. War Machine Detachment: 1 or 2 units with 8 or less HPs. These are deployed together but function separately. These units can be chosen for the primary detachment, the Questoris Knights army list, or from the Baneblade, Banehammer, Stormlord, Shadowsword, Stormsword, Macharius variants or Crassus variants. So TONS of options here. The Great Beast: A cap on 1 unit of 9+ wounds. Monstrous Horde: 1 or 2 of the same units with 8 wounds or less. Sub-Orbital Strike wing: 1 to 3 Marauder bombers, Marauder Destroyers, Thunderbolt Heavy fighters or Crusade Avenger Strike Fighters, that arrive together, but then act independently. It's kinda strange you can't take the Legion Astartes fliers this way, but it does open up the option for more varied air force lists. Some of these units are really quite good. Mighty Fortification: This the only way to take fortifications of 500 + pts. Space Marine Crew: +15 pts for BS 4 on any of these super heavy tanks. Sounds like a deal to me. Battle Servitor Control: +15 points point Option. I think Raven Guard get a bigger bump from this codex compared to other legions, because infantry basically got cheaper and all our legion rules are infantry specific. In addition, tanks got more expensive which hurts tank armies. Beyond cost, a couple units got considerably better, especially for Raven Guard. PRO: Apothecaries being able to attach to a lot more unit and being able to take jump packs or bikes is really a big plus for us. Dark Fury can now have feel no pain and cheap add on character. Same with outrider bike squads with a forgelord. I also like the idea of apothecaries in standard Assault squads or in command squads on bikes. PRO: Assault squads are now only 15 pts each. That is totally at an acceptable level to be fielded, and if you ignore the Pending 40k FAQ, melta bombs could very well turn this into a scary tank hunting unit. It also opens up the Angel's Wrath ROW, which adds the awesome hit and run rule. CON: One of the huge things Raven Guard had on other Legions was that we could get units across the board cheaply. Now everyone can. To this point, I have largely built my lists to attack slow moving enemies. This unit could single handedly shake up the game as A LOT of legions will take at least one of these guys. CON: Grav units are more expensive to field. Amazingly, the grav Rapier managed not to get a price hike, but drop podding contemptors with grav guns, breachers and lightnings all received price hikes. However, the humble speed got a price drop. PRO: With the point cost and rise cost of other grav units I think the grav / multi melta speeders are totally a viable option now. PRO: Dark Fury, with their recent bump to #alltheraventalons, also get the opportunity to take an apothecary now. It's a very scary and interesting unit now. PRO: Seekers with scorpius ammo a really interesting objective campers now. In general, I have been a fan of special weapon units in rhinos, but this unit is so cheap and scores. I could see lists basically revolving around units of these guys. They really get a lot out of infiltrate. PRO: Tactical Support Squads getting the option of an extra hth weapons is really an interesting option for Raven Guard. It's a small option but a good one for us. PRO: Cheaper Tactical Squads. This is a pretty big deal for us, because I feel that raven guard to tac squads better than most. PRO: Cheaper Recon squads, this one is great for the Recon ROW. CON: Cheaper Recon squads do give other legions a infiltrator push back unit. It's not a concept I see used much in 30K but I know I would take a unit if I played another legion. PRO: Tech marines with servitors are actually really cheap and solid little devastator options for us and can infiltrate. PRO: Company Command squad will be used more often. They are pretty cheap for what they bring to the table. I like them for Raven Guard on Bikes with powerfists. PRO: Vets are really really good now. They are basically 16 point vs tacs (with extra ccws) at 13 pts. If we call fury of the legion vs the vet rules a wash, you basically get a free attack and huge shooting and hth customizability and the ability to melta bombs. The other MAJOR thing to notice is that Vets get combi weapons now. With sniper and flamers they are basically Mor Deythan without the re roll, scout and precision strike. But they are eligible to take drop pods, which is a huge win for drop lists. Plus they can be core troops with a delegatus or with a Pride of the Legion ROW. Finally, unliked fatal strike, these guys can use sniper on their flamers when they get charged, making them especially good objective campers. So in general, I think our Legion is stronger than ever and I look forward to running an ALL jumper list. I'm also excited to try out some of the new rules for units I already use and even more excited to try out some units I never really liked before. You guys see any other really big changes I missed?